The mystery creature didn’t stump anyone in this crowd. It is a blind or thread snake, genus Leptotyphlops. I didn’t take many photographs, because I know blind snakes are fragile. These snakes are sometimes called “worm snakes” as they are pink or brown, thin and look like earthworms. This one was dark enough to be mistaken for an elongate millipede. The behavior was totally inappropriate for a millipede though, so I popped it under the microscope. Yes indeed, there were tiny scales. Members of this group are called blind snakes because they lack eyes, although they have a dark spot where the eye would be on the head. Why did I put this cool snake up on this ant blog? About 100 species of Leptotyphlops are found worldwide, and they pretty much all specialize in eating ants and/or termites. Blind snakes eat ant larvae and pupae by actually slithering down into the ant nests. 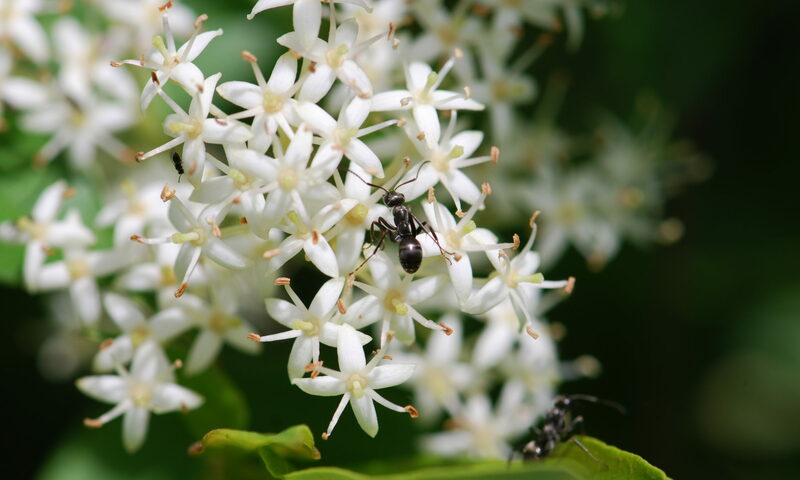 As you might expect, the ants will attack intruders if they are discovered. 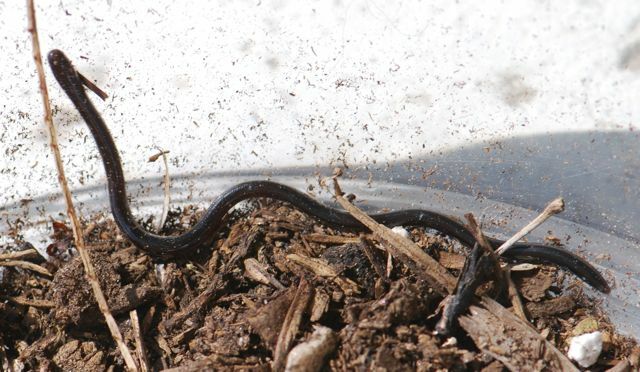 Some species of blind snakes escape detection by slithering into the nest, eating extremely rapidly (they wolf down the ant larvae and pupae by taking three or four bites a second), and then shooting back out of the nest. 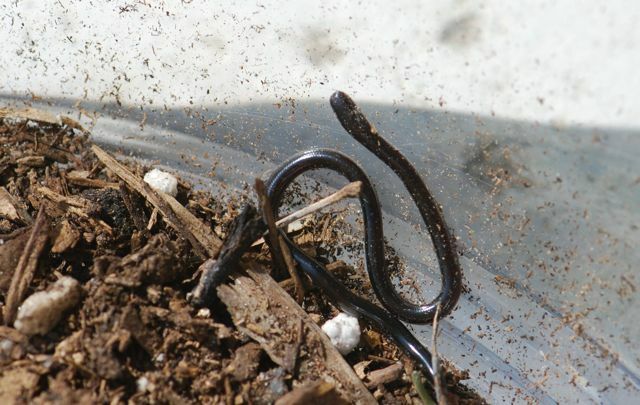 Other blind snakes can defend themselves by squirting out a mixture of excrement and a clear liquid that contains a defensive substance unpleasant to ants. The snakes quickly roll and wriggle through the sticky fluid until they are covered. The ants back away from protected blind snakes, allowing the snakes to eat in peace. Because they are so secretive, I did not ever think I would get to see one. It was an incredible opportunity to experience something I had only read about. I had never heard of them before! Amazing- do they only live down south? Yes, Mike, they are found in the southwestern United States, and further south. Found a lovely little black snake with a whitish belly this morning in my garden in Caracas, Venezuela. He was slithering into a hole in the ground but eventually slithered outside again!About 30 cms long. Unfortunately, no picture because I was too late, but a quick search revealed two possible IDs – Helminthophis flavoterminatus – a sunbeam snake or a dawn blind snake. Any leads or suggestions? He stood up and challenged me when I tickled him with a stick, so I let him slither away down another hole! Wow, 50 in a week! That is a lot. I saw many in our garden in Manila, Philippines. My first task everyday was to save out from the swimming pool the ones in. They were a big help in the termite war. Thanks to that little snakes our home was termite (and anti termite chemicals) free. And our life happier. I have been looking for information on what my boyfrien said was an ant snake. I called Desert Museum, U of A, Pima College, all the people who were herpetologists. No one knew. My cat has been bringing into my house, a snake a day for 4 days. Shiny, copper/silver coloured. Makes about 6-8 coils while moving away. SidewAys. We managed to successfully rescue these buddies, the cat doesn’t have many teeth, so just uses tongue to hold lizards against the palate. This cat doesn’t even know what prey is about. Do snakes have an orientation , NW or SW etc? Can we can know where to send them? Maybe a mommy snake just had a litter in my yard? I’m going to suggest something wacky here. Are you sure these are snakes? Could they possibly be lizard tails that the lizard has ejected to get away? In any case, I hope you found the answer. we recently found one here in our house. we live here in davao city philippines. and yes that creature came from an ant’s nest and my son saw it. so what we did my husband killed it just to make sure it will not harm us especially our kids. are they poisonous?